I leave England once again and have one intention – to visit Norway. I get as far as Sara’s in Malmo, Sweden, and we spontaneously agree, “let’s go to Finland!” And so my Norway plans are put on hold and I board a ferry in Stockholm with Sara, her sister Lea and Lea’s daughter, Aviaja. Nothing can ruin my excitement about visiting Finland, not even the hideous ferry crossing where most people’s intention is to get paraletic, and where the security man threatens to confiscate our food. Apparently we are not allowed to bring food on a sixteen hour ferry crossing which doesn’t cater for vegans! We arrive in Helsinki. I have wanted to visit this city for about ten years, but all I see of it is a ten minute tram ride to a hitchhiking spot. I vow to come back to Helsinki in a week or two, but fate has other ideas, and I never make it back there. I also never make it to Norway. I hitch alone northwards, whilst Sara and family take the train. 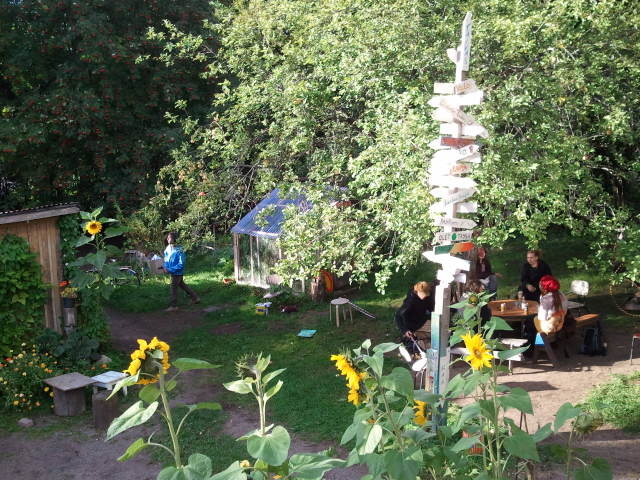 We are heading to the Finland Rainbow Gathering (a hippie meet-up) in the countryside in Paukarlahti. I repeatedly mutter to myself, “I have never seen so many trees!” There is forest absolutely everywhere. Finland may win the award for Best Country Ever to Hitchhike in. Or maybe it is the four-leafed clover that my new Rainbow friend, Tuomas, gives me on the ferry. My first driver stops trucks to ask them their direction and he causes traffic jams as he tries to find me my next lift. I am then picked up by Janne, the kindest man on Earth. Janne waits with me for two hours for Sara, Lea and Aviaja to arrive at the train station. He then drives a 70km detour to drop us all off at the Rainbow Gathering. 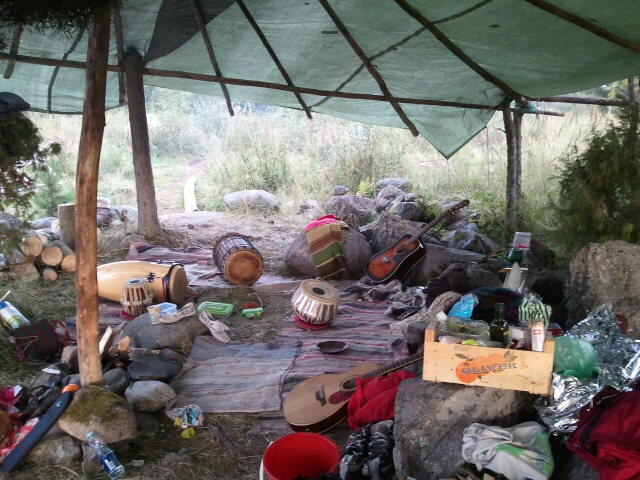 My only experience of a Rainbow Gathering is last year’s Middle East one (which my friend Jo wrote about here). The Finnish Rainbow is nothing like it. For a start, it’s tiny. There are only two people to greet us when we arrive! 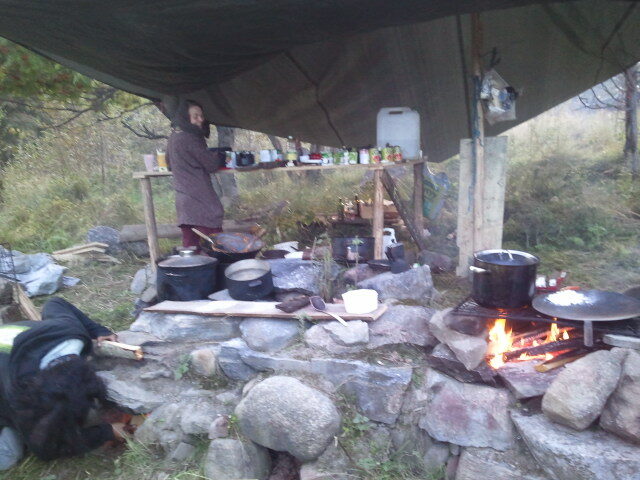 I stay at the camp for about two weeks, and in that time only a core group of maybe ten people keep the gathering alive. At its peak, the gathering attracts around forty or fifty people. Still, the small numbers mean that I get to know everyone on a more personal level. However, there is a lack of atmosphere because half of the people choose to sleep in a house close by instead of camping. 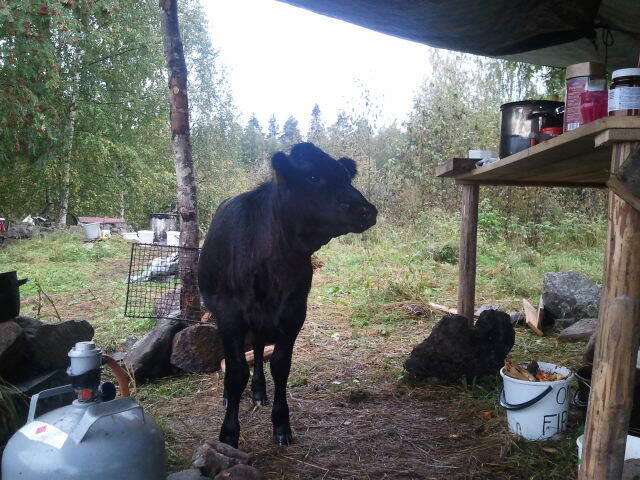 The kitchen table is destroyed by cows shortly after this photo is taken because they want to get to our pancake mix! 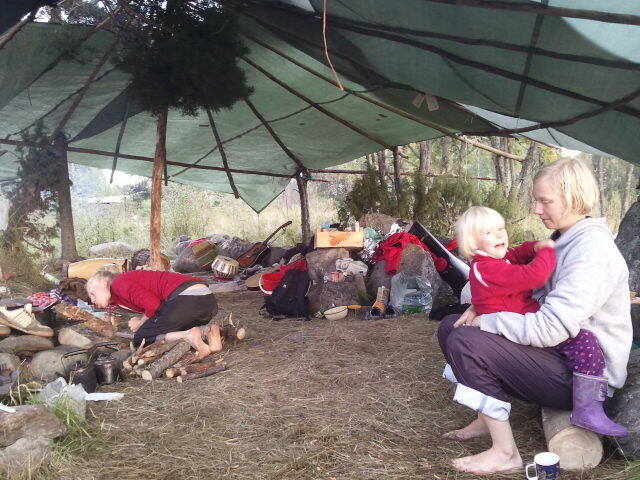 The Finnish Rainbow family is full of beautiful people, both inside and out. There is a stronger connection with nature here in Finland than in the rest of Europe, and most people I speak to believe in spirits. Some even believe in elves. I also love the Finnish language, and the fact that I can get really healthy vegan food everywhere. Everyone kindly talks English in meetings when quite often I am the only non-Finnish speaker there. I can definitely see myself living in this country sometime in the future. 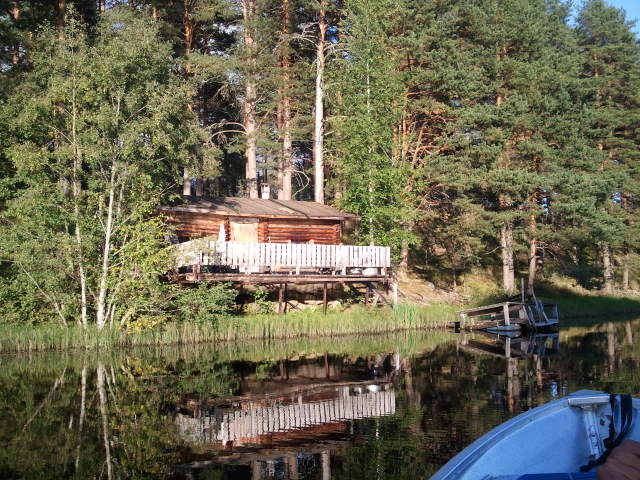 By the time I leave Finland, I have fallen in love with it. 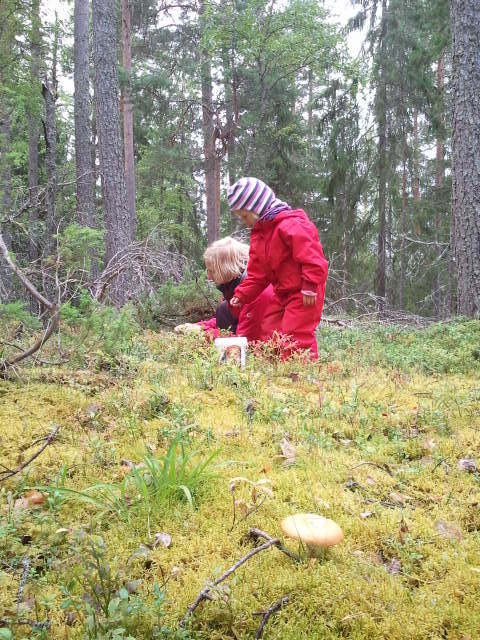 The forest has mushrooms and berries in abundance and Sara gets really excited about picking blueberries which would cost her a fortune in Sweden! Finland is known as the land of a thousand lakes, but what the tourist board doesn’t tell you is that along with the thousand lakes there are ten million mosquitoes. A quick toilet visit in the woods results in twenty or thirty mosquitoes sucking the blood on my legs and bum. I spend most of my two weeks at the gathering swearing loudly and flailing my arms wildly in the air, trying to fight the damned insects off me. 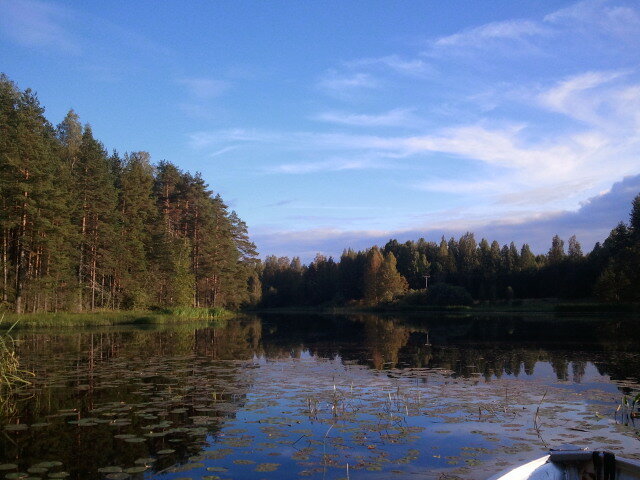 I find it hard to contemplate the beauty of the Finnish nature when I have a constant bzzzz sounding in my ears. No-one else is bothered by the mosquitoes – they are all so used to them, having grown up with them. I curse my unwritten vegan rule not to kill any creature. The country lives up to its stereotypes and people love Moomins (Muumi in Finnish). 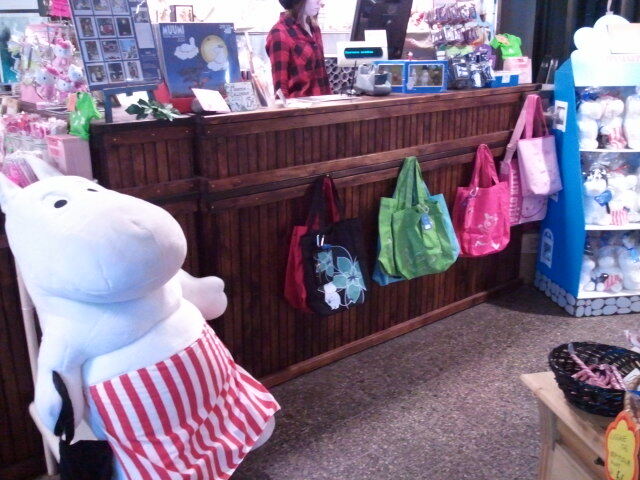 There is even a Moomin theme park. 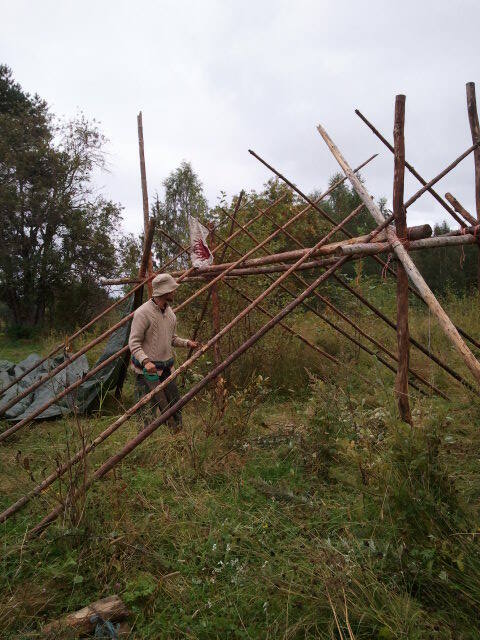 The people here also LOVE saunas and the Rainbow family even build their own one. They seem to enjoy sweating profusely in the sauna and then jumping into a freezing cold lake and they can’t understand why I refuse to join in! 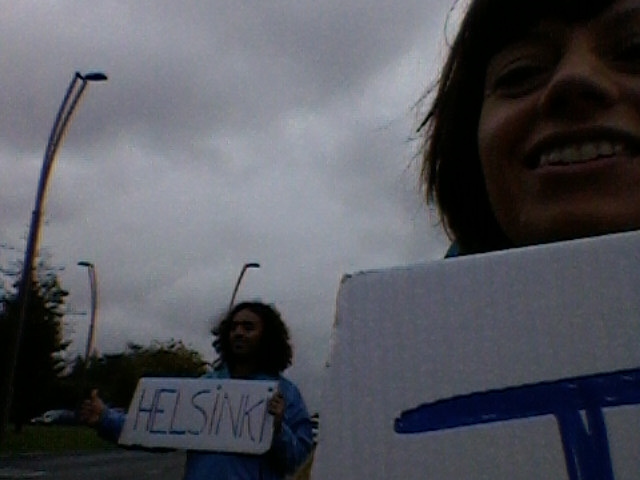 After the gathering I hitchhike with my friend Arjun to Tampere. Hitchhiking is, once again, easy. We stick our thumbs out and the first car stops. Our driver exclaims, “ooh, I was hoping to find hitchhikers to take with me!” Arjun describes Finland as “quaint”, and he is right. 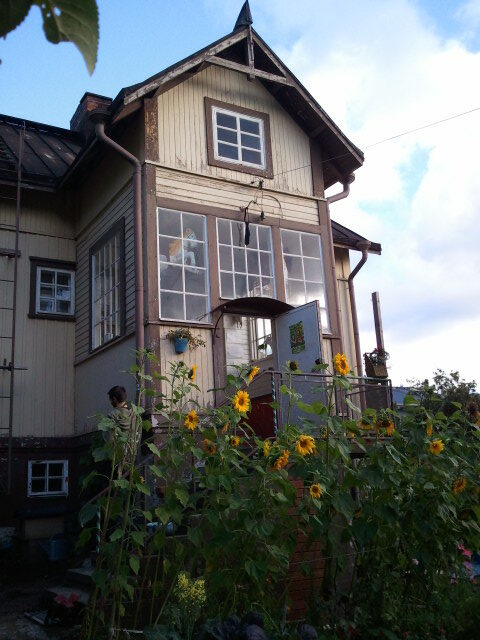 Even Tampere’s social centre, Hirvitalo, which houses an anarchist bookshop and flies a black flag, is pretty. “My sign is better than yours!” says Arjun! Whilst planning my journey north, through Lapland and Norway, I receive the news that my beautiful grandmother has unexpectedly died. So I change direction and start heading west, towards Sweden, then Denmark, Germany, Holland, Belgium, France, and finally England, where I will say a last goodbye to my incredible Nan, who I loved so much. some beautiful people there, but it was not a real Rainbow Gathering. hey Lisa – this is Alex Jake’s friend..he sent me the link to your blog..i love the photos…st petersburg where I am from is not so far away and seeing your pics of nature reminds of it..so good..and I love moomins!!! Wow, you’re getting a lot of comments now, aren’t you!? I was a bit behind on your blog, but I just caught up. 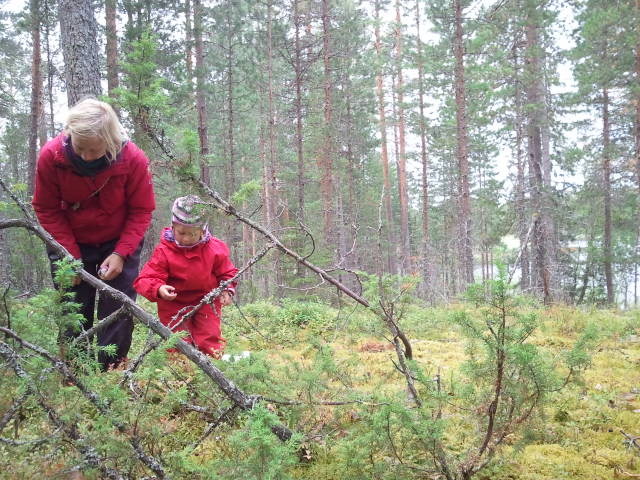 Funny how I was also picking wild blueberries at the same time as you in another forest a little way South in Estonia! 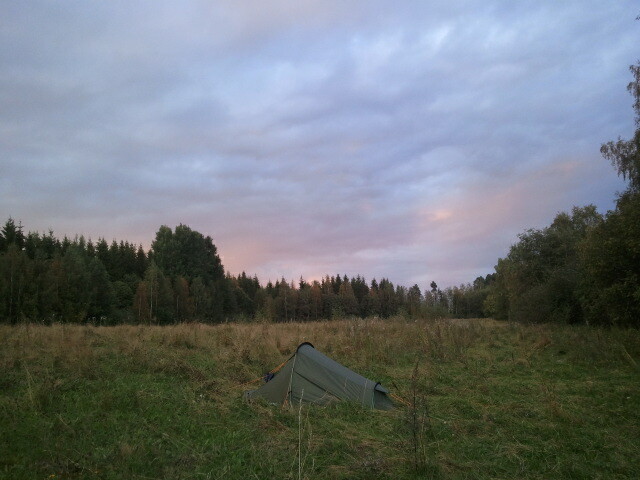 Will try to finish my Baltic blog today. Shame I missed you, but that boat crossing is allegedly impossible to hitch and it was cold enough for me in Estonia. Lisa! I haven’t been much on a computer but now I finally got to read your entry about Finland. Made me laughed and smile, got so warm feeling of Tuomas’s clover -thing. Good that you are planning to move here with us, already waiting for that 😉 Hugs and tons of love to you! Enjoy the light that you’re carrying with you, it’s really beautiful.